It's great to have some good weather, and the girls love playing outside in the garden so it makes days at home easy and fun. Last summer we got a wooden wendy house for them, and ThingTwo's enjoying that this year for the first time (ThingOne's less sure about ThingTwo messing things up in there). 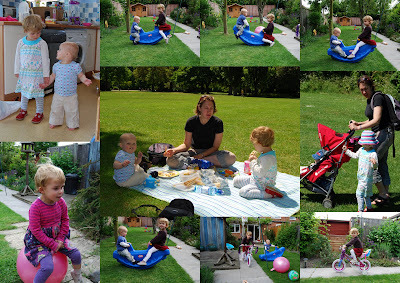 The garden does tend to get a bit cluttered in the summer though, with a tent and tunnel combo, a push chair, bikes (including a new 'big girl's bike' for ThingOne), balls, a space hopper and now a plastic see saw too. The last item was ostensibly for ThingTwo when ThingOne got her new bike, but ThingOne's having a great time on it too. She's trying to see if she can send Belle flying through the garden. It's starting to look like she may succeed. I'm sure we never had this much stuff as kids. Oops. Think I may have offended my mum!